Cheap Custom House Key Tags, Personalized in Bulk. Promotional, Soft Touch. Black, White, Royal Blue, Green, Red, Yellow, Granite, Translucent: Blue, Green, Red, Neon: Green, Orange, Pink, Yellow. 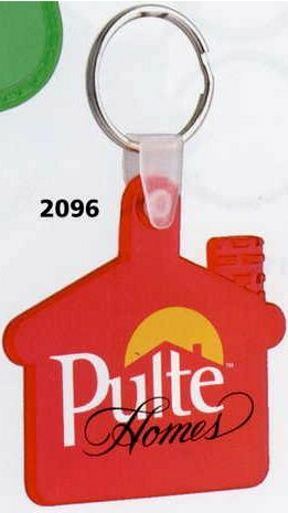 Bulk personalized house key holders at the Budget Prices in the USA and Canada. American clients pay no taxes. Our personalized house key rings are ideal for realtors, construction companies and financial businesses. The custom imprinted house key rings are made of durable soft-touch flexible plastic and they are attached to a 1" silver split ring. Wholesale Heart key rings and Number One key rings are also available at the same low price: ask for pictures. Free artwork design. We will send you a proof for your approval before production. The unit prices below include your 1-color custom imprint. Add the amount shown for each extra color. Additional imprint colors: add $0.12 perhouse key tag. Setup: $39.00 per imprint color. Production Time: 5 days after art approval. Add $0.14 per item for 3 day rush service. Colors: Black, White, Royal Blue, Green, Red, Yellow, Granite, Glow*, Translucent Blue, Translucent Green, Translucent Red, Neon Green, Neon Orange, Neon Pink, Neon Yellow. Attached to 1" silver split key ring. Add $0.08 for optional 1.5" silver split key ring or 1" gold split key ring. Packaging: Bulk. 300 key tags per carton of 11 lbs. OPTION: individual poly bags (recommended to eliminate scuffing): add $0.05 per house key tag. Production Time: 5 days after art aproval.